Well, friends, as it turns out I ended up having to make some last minute plans to leave the country – I’m sitting in a hotel in Athens, Greece as I type this! Bad news is, this means I’m not able to draw names for the big swag giveaway just yet. But the good news? There’s time to send in an entry–or an extra entry–before the drawing! I’m extending the contest through May 5th, so that I have time to get back home and package things all pretty for you guys. 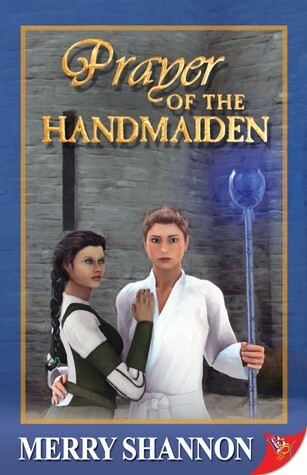 Have you read Prayer of the Handmaiden yet? A couple of the easiest ways to enter are to leave your thoughts on the new book on Goodreads or Amazon for others to find. Or send me a pic of you with the book… I love those! Anyway, sipping wine and eating an Italian baguette and thinking of all of you fine folks who keep me inspired. See you in a couple weeks! While PotH has been available for two weeks now via the Bold Strokes website, its official book birthday means that now it’s also available at all other regular retailers, notably Amazon. Those who ordered the e-book from Amazon probably got access to their copy yesterday, and the rest of you should be getting your paperbacks shipped out shortly.